London in the mid-17th Century was the third largest city in the world and the largest in the British Isles with a population of roughly 300,000 people. It was a time of great turmoil. England had been at war with the Dutch since January of 1665 and the French had fired on an English ship. In July, King Charles II and his brother James, Duke of York had gone onto the roof of the Palace at Whitehall and heard cannon fire from ships fighting in the North Sea. In May of 1665, bubonic plague broke out in the city. By September, the court left Whitehall in London for Hampton Court, then Salisbury and finally settled in Oxford. The deaths were beginning to decline and the court returned to London in February of 1666. By the time this outbreak of the plague was spent, it had killed one in five Londoners. In August the rumors were flying that the Dutch fleet was on the prowl and by September of 1666 Londoners were expecting to attack or be attacked at any moment. The summer had been excessively hot and dry. Thomas Farriner was a regular tradesman in London who had a contract to provide hard tack for the Navy’s Victualing Office. This was his main source of income but he also baked other goods such as bread and pies for sale to everyday customers. His bakery was on Pudding Lane, a short street that ran from Little Eastcheap down to Thames Street. His household consisted of himself, his daughter, a maid and a manservant, all living above the shop. After closing on Saturday evening September 1, Thomas checked his oven, placed wood to light for the morning, raked up the spent coals and went to bed. Around midnight, his daughter Hanna checked the oven again and retired. Most of the houses in London were made of timber and had overhangs, over the street. The wind was blowing and the fire burned for about an hour, seemingly able to be contained with minor damage. Constables arrived and they called the Lord Mayor of London. Sir Thomas Bludworth quickly appeared and the firefighters tried their best to persuade him to create a firebreak by dismantling adjacent homes. Worried about the problems this would raise with landlords, Bludworth refused and actually returned home. Thus history was made. There really was no fire department at the time but there were procedures to be followed in the event of a fire. The public was warned of an emergency by the ringing of the church bells backwards, creating a muffled sound. The authorities were to block off the affected street. A fire line was supposed to be made from the Thames River to the site, where the brigade could take buckets of water to douse the fire. The fire engines were supposed to come and help. On this September morning, the fire trucks had trouble getting to Pudding Lane and when they did, the flames were too great for them to get close enough to help. And the waterwheels by London Bridge were already on fire. With the winds, lack of water and the immensity of the flames, the fire was beginning to burn out of control. By Sunday afternoon, the King and the Duke of York were taking the royal barge down the Thames to view the damage. They were both convinced that houses needed to come down to create a break, especially near the Tower. The Tower of London was the storehouse of munitions. If the flames reached this powder keg, the result would be a catastrophe. The King called in Sir Richard Browne, the former Lord Mayor, former MP for the City and a man with excellent military credentials. Charles overruled Bludworth, ordered Browne to pull down buildings and called in troops to help. The destruction of the fire was uncontrolled and widespread by Monday morning. Many people were beginning to suspect all was not well. Looting had started along the wharves and people were starting load up and move as many personal belongings as they could and vacating their premises. Carts were hard to come by as well as boats to haul goods down the Thames. Booksellers were putting their stock in the crypt in Old St. Paul’s Cathedral. Some effort was still being made to fight the fire but it wasn’t enough to contain the unrestrained flames. Charles put his brother the Duke of York in charge of the efforts to fight the fire. James was always at his best during a crisis. He set up brigades of ordinary citizens along with noblemen at official stations along the line of the flames. The gallant efforts of the noblemen were meant to buoy the hopes of the citizens and also allow for more authority to pull down buildings in an effort to create breaks and slow the flames. James rode from station to station supervising the efforts. His hope was that the Fleet River would break the fire. But on Tuesday morning the flames jumped the river. Efforts began to move the Exchequer to safety. Both Charles and James physically worked to help put out fires and urged the men on. Now the fire was threatening Old St. Paul’ Cathedral. 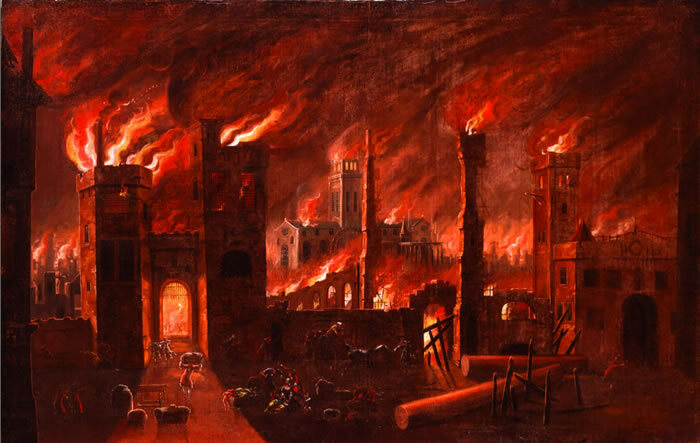 The flames soon were seen on the roof of the cathedral and when the fire reached the crypt, full of the bookseller’s paper, it blew up in a roar. By midnight, there was hope the fire was reaching its pinnacle. The Earl of Craven had managed to stop and put out the fire at Holborn Bridge about noon on Wednesday. Later in the afternoon, the wind died down and finally stopped by five o’clock. There were still some fires burning around the city but the work to stop them was finally paying off. An exhausted Duke of York went to Whitehall to rest but about 70,000 Londoners had no home to go to. Many of the city residents had fled to the fields outside the City walls, particularly to Moorfields, London’s first civic park. The work to help the people and start rebuilding the city had begun. Charles issued a proclamation to open markets to sell food. There was a near riot on Wednesday night. 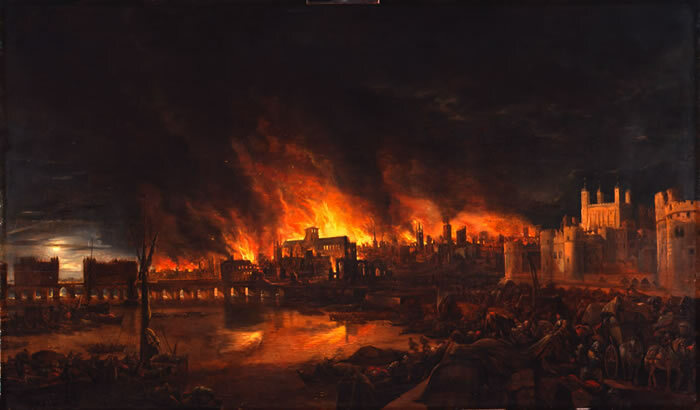 The Duke of York discovered the Inner Temple was on fire and was threatening the Inner Temple Hall and the Temple Church. The Duke used gunpowder in an attempt to save the buildings. It didn’t save the Inner Temple but the efforts kept the Hall from burning down. On Thursday morning, the King took his barge down the Thames to examine the damage. The destruction of houses near the Tower had saved it from exploding. It was decided to move the gunpowder out of the Tower and more demolition of houses was done as a precaution. He then went to Moorfields and addressed the crowd. He assured them the fire had been an accident and that he would die defending them. The speech worked and there were no more serious disturbances. In assessing the damage, a survey revealed that 13,200 houses burned or were demolished in 400 streets leaving 70,000-80,000 people without shelter. Of the area within the Roman wall, 363 acres burned as well as 64 acres outside the wall to the north and west. Eighty-seven churches, forty-four Company Halls, the Royal Exchange, the Custom House, St. Paul’s Cathedral, City prisons, the General Letter Office and three of the western city gates in the Roman wall, Ludgate, Newgate and Aldersgate all were lost. The stationers had devastating losses. 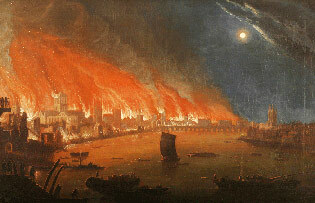 Many went bankrupt when their stock went up in flames in the crypt of St. Paul’s Cathedral. It was a calamity for English publishing. The number of actual deaths is hard to determine. It’s been estimated between 8 and several hundred lost their lives in the actual flames or in the camps in the fields. We will never really know. But the City found a way to recover slowly and rebuild over the years. Another great read. The fire was a great calamity but it could have been much worse if leaders had not stepped up. Jo, It was a horrible event but it’s great how the Londoners bounced back and rebuilt. Keep an eye out here for a story (and pictures) of Old St. Paul’s Cathedral as I have a post in the works! A horrifying story – the paintings say it all. So many people without homes, in such hardship, and the loss of so many beautiful buildings. I’d love to have seen the original St Paul’s. Very interesting! Thanks Susan. Loved writing about this little bit of history. London has recovered quite well, I think! This was such a tragic event. First the poor people survive bubonic plague and then the fire comes. I’ll bet there were a few people who thought the 666 in 1666 very fitting. Agreed J. G. It was a pretty bad time for England all round. It is amazing that London was able to recover so well. So many lives lost (can’t imagine where the “8” came from; assume it was in the many hundreds). What devastation to the publishing industry there, too. Excellent post.